Cressbrook Hall in the Derbyshire Peak District is an absolute gem when it comes to wedding venues. I had the pleasure of photographing Sara and Gavin's wedding here in the summer, and I thoroughly enjoyed my day. Cressbrook Hall is a stunning venue for wedding photography, and I knew from my first visit to the venue that I'd love working there. The hall offers guests accommodation in either self-catering cottages (which I must say are almost as beautifully appointed as the hall itself) or by means of bed-and-breakfast. 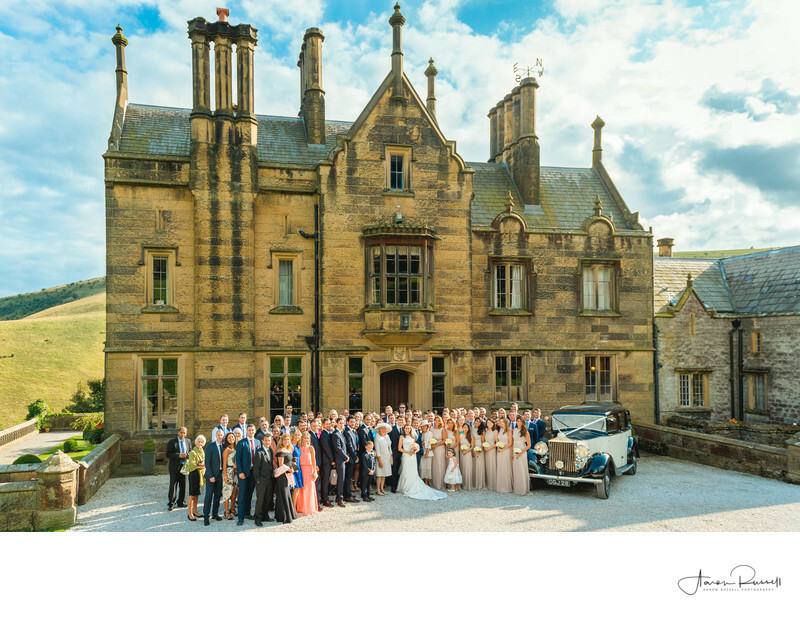 All told the venue can sleep an impressive 52 guests, right in the heart of the Derbyshire Peak District. It's quite rare to find such a stunning wedding venue, in a remote location that can easily sleep your entire wedding party! The hall is set in 23 acres of woodland and open fields and benefits from far reaching views in one of the most picturesque parts of the country. There are manicured gardens, which are licensed to hold civil ceremonies and also make the ideal location for some stunning wedding photography too. Both Sara and Gavin got ready at Cressbrook Hall on the morning of their weddings, but in order to not accidentally run into each other, they chose to do so in cottages as opposing ends of the venue. I had my second photographer spend the morning with Gavin and the boys whilst I spent my time there with Sara and the bridesmaids. When it came time for the big group photo, I always knew that there was only one place that I wanted to do this - in front of the hall, with the house and grounds fully on display. This was the ideal location for many reasons - first of all it was big enough to fit all of the wedding guests, but also the sun was at the right place in the sky that people weren't staring into it, and finally there was a grass bank opposite that I was able to stand on in order to get a higher vantage point. I made sure all of the guests were roughly where I wanted them before running up the small grass bank in order to take this wonderful photo.